When I was a kid no matter what was for dinner, I always had room for one thing….no not desert, (although I had room for that too) but what I really craved was, a bowl of cereal. I don’t know why but it could be 5 minutes or 5 hours after dinner and I just HAD to have it. I have since gotten away from this habit in the last several years, UNTIL now. I just bought a healthy version of “Sugar Smacks” for the kids at Whole Foods called, “Honey Kissed Wheat Puffs” by Isabel’s Way. Of course the first ingredient is still (evaporated milled) sugar and although there aren’t many other ingredients (and I can read them all), one of them is corn syrup – which is basically more sugar. What is really bad is that I literally just downed 2 bowls after several healthy portions of tonight’s pasta. What can I say (as I wipe the milk off the bottom of my chin)? How ‘bout “Do as I say – not as I do”. 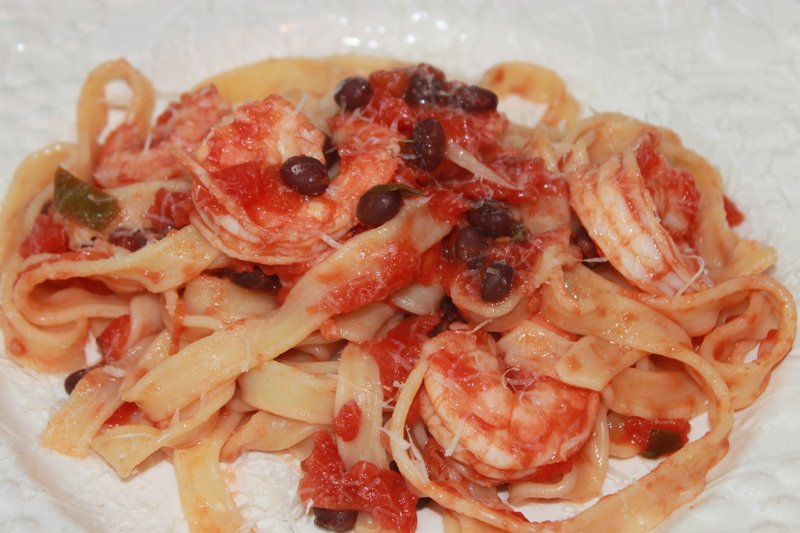 Shrimp w/Black Beans and Tripoline Pasta: I threw this together at the last minute with items from my pantry/freezer– it took as long as the pasta took to boil (10 minutes) and was easily enough for 6 people. Defrost some (cooked) shrimp from the freezer – I used a whole bag. Boil pasta water and cook 1 lb. of GF pasta (al dente). I used Tripoline which is like linguine but the edges are curled a bit. Heat up some garlic in EV olive oil in a large pan. Add a large can of Peeled Tomatoes and a small can of Diced Tomatoes to the pan. One can is enough if you are only making 1/2 bag of shrimp. Smash tomatoes with a wooden spoon. Add salt/pepper, fresh basil and a dash of hot pepper flakes (trust me it will not be hot). 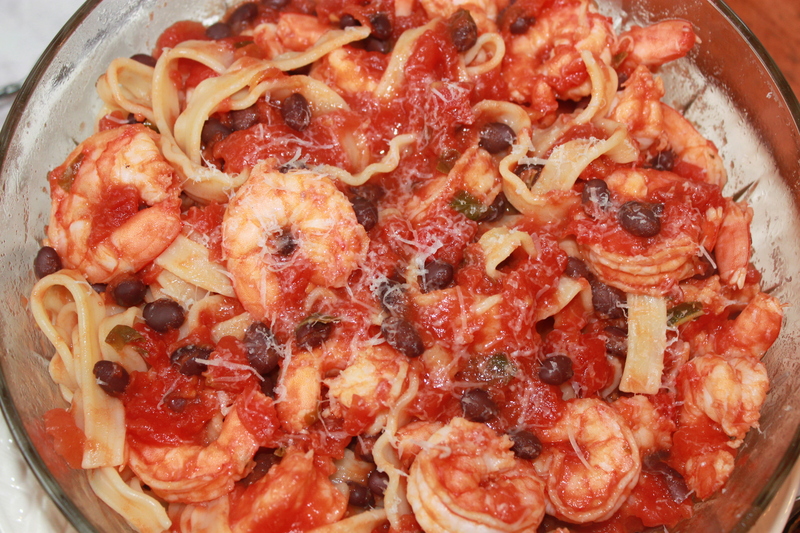 Squeeze the tails off the defrosted shrimp and add to the pan of tomato sauce – Toss. Pour sauce over pasta and serve with grated cheese on top. Tell kids to pick a specific amount of basil leaves (they have to count). 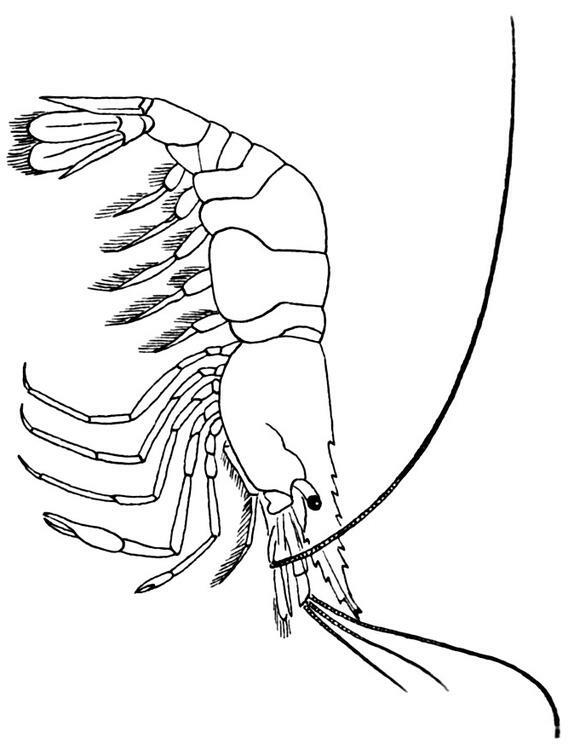 Help take the tails off the shrimp. Help smash or just peel the fresh garlic. Help use can opener to open tomatoes. Get a large chunk of parmesan cheese and let the kids use a hand grater.